Rescuers temporarily suspended efforts Friday to recover a car, reportedly with two boys inside, that went into the rain-swollen Green River south of Seattle, fire officials said. Kent Fire Capt. Kyle Ohashi said conditions in the fast-flowing and murky river were too dangerous for the rescue crew. Capt. Kyle Ohashi of the Kent Fire Department told CBS affiliate KIRO that divers found a metal object in the river that could be the car. He said there's "not much hope" for two children, ages 2 and 14, who were reportedly in the vehicle and not able to get out. Ohashi said because the river has risen so high and is flowing so fast, it is not worth risking divers' lives to recover the car immediately. Further efforts to recover it will be under the direction of King County officials, he said. A tow truck was brought in to haul out the vehicle. But the suburban river has long been used as a dumping ground for cars, and Ohashi said that because of the swift current and poor visibility, rescuers weren't able to positively say it was the missing car or whether anyone was inside. Ohashi said a 16-year-old girl driving the car escaped and called authorities around 8:45 a.m. to report that her Volkswagen went off a road and into the river. Auburn police Sgt. Scott Near said the driver is the aunt of one of the boys. She was taken to Auburn Regional Medical Center. "She is extremely distraught," he said. Near said the car was northbound on Green River Road when it went off the road just north of the Auburn Golf Course. "She was able to get out. She went back into the water to try to rescue the kids," he said. When she wasn't able to reach them, she flagged down a vehicle and called for help. Battalion Chief Dan Bosch of the Valley Regional Fire Authority said the girl told him when he arrived at the scene that she had lost control and crashed into the river. Steady rain overnight in Western Washington left many roads slick and waterlogged, along with swelling many of the region's rivers. "The river has risen 4 feet. It's extremely murky, and the current is going good," Near said. 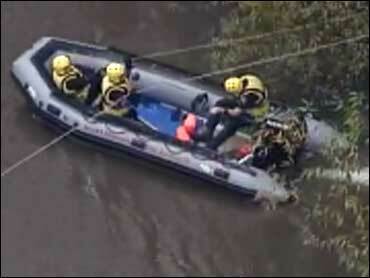 A dive team and KIRO's Chopper 7 began searching for the car in the muddy, fast-moving waters of the river near Kent. Teams in three boats searched the waters of the swiftly-running river but the river is extremely muddy and visibility is low after heavy overnight rains sparked flood warnings and car crashes across Western Washington. Divers have also entered the icy waters to aid in the search. At the Kent Fire Department's request, Chopper 7 assisted in the search from the command post, where the vehicle entered the river, to Central Avenue in Kent. Video showed teams using a device to drag the river and divers wearing weight belts to help them maintain control against the river's strong currents. Bosch told the Seattle Post-Intelligencer that rescue workers probing the river with long poles struck an object they believed to be the vehicle, about 100 yards north of where the girl said it entered the river. When they first struck it, a child's drinking cup floated to the surface, he said.